Click here to see an alphabetical list of BNI Northern California chapters. 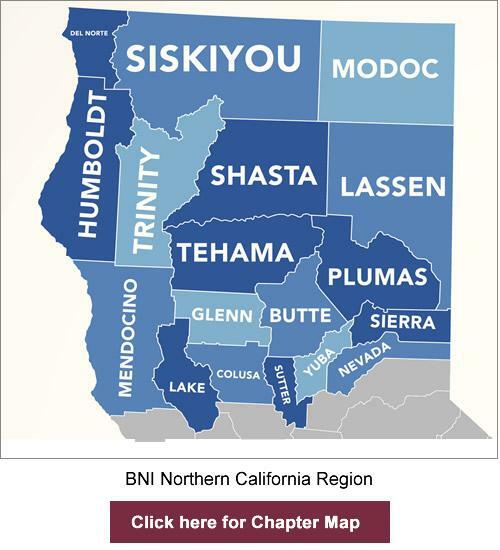 The BNI Northern California region serves Butte, Colusa, Del Norte, Glenn, Humboldt, Lake, Lassen, Mendocino, Modoc, Nevada, Plumas, Shasta, Siskiyou, Sierra, Sutter, Tehama, Trinity and Yuba counties. The best way to find out about BNI is to visit a chapter. If you are a first time visitor, please call (707) 780-8118 or click here to send an email to visit and join a chapter. See the map below for an overview of BNI Northern California chapters. Click here to see the chapters currently forming in the BNI Northern California region. If you are interested in starting a new chapter please call Trey McAllister, Executive Director BNI Northern California at (707) 780-8118. You may use the "Advanced Search" button below to locate a specific BNI Northern California chapter.